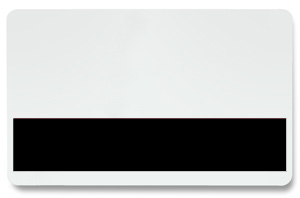 CC30-BM White Cards with Black Barcode Masks are credit card size (CR-80) with a 30 mil thickness. Barcode Masks are used to prevent the photocopying of bar codes. CR-80 30 mil cards are the standard size and thickness of most identification cards being used today. Our PVC cards are designed and manufactured with the highest graphic quality materials for excellent printing results. PVC cards are used in today’s direct-to-card and re-transfer card printers. CC30-BM White Cards with Black Barcode Masks are perfect for: Time Management Systems, ID cards, gift cards, business cards, membership cards and loyalty cards. The PVC cards are packaged in quantities of 500, quality inspected and shrink wrapped for protection and convenience. CC30-BM PVC cards must be handled with extra care. They can be easily contaminated by dirt, oils, and dust particles. Running contaminated PVC cards through your printer can ruin the print quality of the card and can cause damage to the internal print head. Keeping your cards stored in a safe environment and handling the cards by the edges can help reduce the possibility of these types of problems.